Browse: Home /	Community Building, Community Gardens, Composting, Events, Food, Street Gardening, Sustainable Flatbush News, URBAN FARM & GARDEN, ZERO WASTE / Church Avenue Communal Garden: May 2011 updates! Brooklyn Native Plants Tour May 15th, Spring Planting at the Garden May 21st, and Celebration with Flatbush Farm Share CSA June 8th! 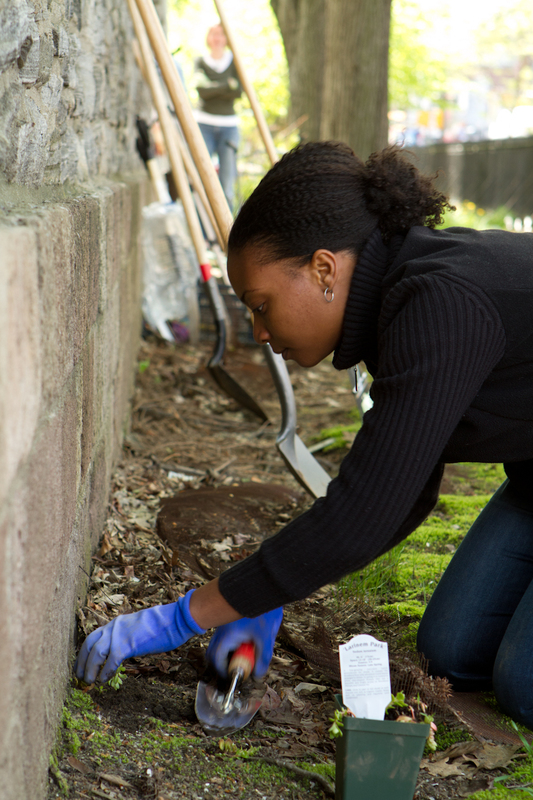 Thanks to all who came out for our first spring planting at the garden on April 30th! We were able to score some beautiful native plants from the 12th Annual Wildflower and Native Plant Sale at Westchester Community College for the first installation of the Church Avenue streetscape, including a beautiful Serviceberry (Amelanchier) bush. The edible garden also looks great, and we’ve now planted okra, cauliflower, collards, cherry peppers, green beans, and more in sub-irrigated planters created from reclaimed materials! There are several exciting events in the works for the garden over the next month, please save the dates! Events will take place at the backyard space of the Flatbush Reformed Church, at Kenmore Terrace and East 21st Street, unless otherwise noted. As part of NYC Wildflower Week, our own Chris Kreussling (aka Flatbush Gardener), Director of Sustainable Flatbush’s Urban Gardens and Farms Initiative, will partner with Compost for Brooklyn to provide a tour of two native plant gardens in the neighborhood. The self-guided tour begins at Compost for Brooklyn, Newkirk Avenue and East 8th street, and continues to Chris’s home garden. Register here for this free event (and for directions). Spring Planting and Potluck: Native Plants Edition!!! Join us for a special spring planting day and potluck meal! This is our second installation of spring planting days at the the Church Avenue Communal Garden. We’ll focus on beautifying the Church Avenue streetscape and preserving our urban ecosystem with plants that are native to the New York City region. Enjoy a beautiful day outdoors at the historic Flatbush Reformed Church! A composting demonstration and workshop will be held from 11-12. Bring food or drinks to share with your fellow gardeners. 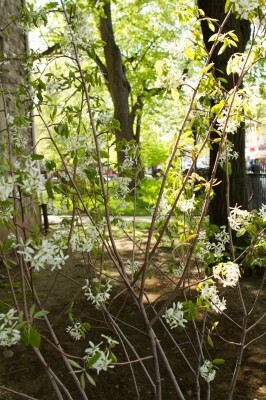 Spring Planting Celebration and Potluck with the Flatbush FarmShare CSA! Join us for a potluck social at the Church Avenue Communal Garden to celebrate our spring plantings and the first day of the season for the Flatbush Farm Share CSA! We’ll have info tables, wine tastings, live music, and more. Bring finger food and/or drinks to share. See you at the garden! The Church Avenue Communal Garden is a new community garden located on the grounds of the historic Flatbush Reformed Church property at Church and Flatbush Avenues. The project is a partnership between Sustainable Flatbush and the Flatbush Reformed Church, and will include a rain garden and community space, an edible garden, and a native plant streetscape along Church Avenue. As we begin our first planting season this spring, the garden will become a community space for Flatbush residents to participate in workshops and events around nutrition, composting, container gardening, native plants, and local food, including special activities for youth. For more information email emily@sustainableflatbush.org or call 718.208.0575. Come get your hands dirty with us! This is all so exciting! Cortelyou Greenmarket opens next weekend! End-of-Season Workday Party at our Healing Herb Garden! GreenHome NYC monthly forum returns!